On Easter, I taught Boo to knit. I broke my cardinal rule of "no knitting lessons until you're six" for her, partly because she is an unusually bright child, but mostly because I had promised her I would. She might have tricked me into it, since she is velociraptor-opening-doors bright. I never stood a chance. LittleJ saw that we were knitting and DASHED over to her purse, where her Looped Loop cowl in progress was hiding. It's beautiful, and I couldn't be prouder. 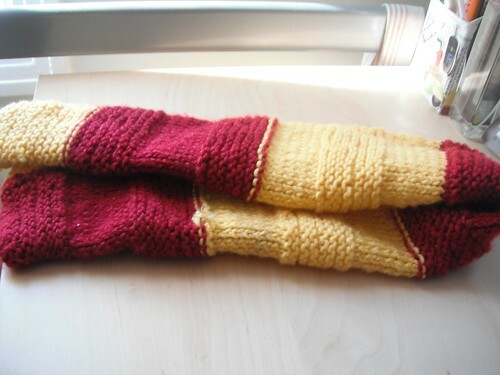 Here's the picture of her Harry Potter scarf, but she said I could only post it with the proviso that she was eight years old when she started knitting it. What I expected to happen was that Boo would be enthusiastic while she was learning, but that something more exciting would come up and she would come back to her knitting later in life. Or at the next family function when I pulled my knitting out. This is ain't my first time at the rodeo. What actually happened was something that a knitting Auntie only dreams. I had to tell her that we had to stop knitting and eat dinner. Between courses, she would bound over to my seat and ask me if it was time for more knitting. Finally, after dessert, it was time for more knitting. I might be an opportunist, but given her enthusiasm, I decided to get some audio from her for the podcast. (Boo is around the 30:00 mark. It's worth giving her a listen.) We knit together for a little while, but it was eventually time for us to go home. Two hours later, I got a text from Boo's mother, which read "She can't stop. She's hooked," with a photo of Boo knitting next to a lamp. Yay for a new knitter! Will we be able to see a pic of you and the girls enjoying the fibery bonding? So great to indoctrinate a new person to the fiber world. Can't wait to hear where this all leads. 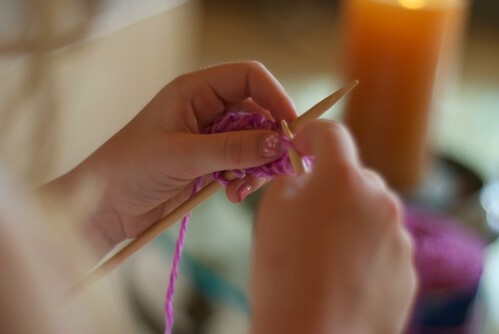 And yes, most people do not talk and knit when they are beginners! I listened to your podcast the other day and loved hearing Boo talk about her knitting. She sounds really sweet and a new little knitter is always fantastic, and an obsessive one is even better - must take after her auntie! A) Just listened and died of cuteness, even tho you warned me in advance. B) The Pink Mafia Rises! The podcast with Boo was fabulous, I loved every bit of it! What fun for you to get to be the one to teach her and of course ENABLE her since you are the "Tiny Pink Enabler"!